Just four weeks ago, I was stuck in the traffic of Dhaka, commuting to my work. Life was stuck in a routine, a boring one. Get up at 6 am, slip into jeans and tops, drape a scarf around the neck, have breakfast while mom packs the same thing for lunch, hop into the car, finally reach office after a sweaty battle with Dhaka traffic, and coming back home after similar struggle. Hardship doubles up when it rains. I used to be the happiest on Thursday nights. Not like I planned a lot of stuff for the weekend, stuff that could balance my weekday struggle. The thought of sleeping a bit longer in the morning and not having to go outside of home energized me a lot. I avoided going out as much as possible. Surprisingly, my parents hate to see me at home doing nothing, even if it’s weekend. They would offer me to go take a walk outside, but my one despising look was enough make them realize how much I hate the idea. Catching up with friends didn’t count and was something I was always up for because that was the only time I could be ME, only time I could rant about anything and everything, only time I could find some solace, altruistically. I was an intern at the Ministry of Foreign Affairs in Dhaka for three months. It’s not as impressive as it sounds like. Ministry never had interns before; fortunately or unfortunately, I and one of classmates were the first interns (read guinea pigs). We didn’t even have a desk to work on. We just found ourselves a place in the corner of the library. So, the internship went more like a pilot project, an opportunity to make the pitch smoother for the future interns, our juniors at the university who can thank us later. At least in one case, I was lucky because this classmate-turned-to-co-worker is one of my dearest friends. She was the best person to help me out whenever we were asked difficult questions like, “What you want to do next?” or “Why are you here?”; someone with whom I had done multiple group assignments where I always tended to be a free-rider. We were aliens. Till the end of the internship, we had to explain to the security guard at the entrance why we want to go in. Till the end of the internship, we explained at least one person a day about our position, our motive, our job description, and why we chose to intern here at the ministry rather than going for some other sector that would make a proper utilization of us. Nobody cared or even noticed if we bunked office or left earlier. For three months, we left no stone unturned in search of opportunity to work and receive exposure as much as possible. We met some extra-ordinary personalities who have been contributing with their brainpower in terms of forming foreign policies and building up foreign relations for the country. We looked for opportunities to work where the future interns can be engaged in. Well, we also undertook assignments that we can boast about; for example, writing up statements for Bangladesh on international issues for the UN General Assembly, researching and reporting on opportunities of some proposed and existing diplomatic missions abroad, and developing resources helpful for day to day operation of the ministry. Within one week, I am in a van, travelling to a remote village of the Northwest of Bangladesh, a place where I have never been to, with colleagues whom I met just a couple of days ago. I was going there for a field visit because within 2 weeks I was going to shift there with 18 volunteers and my UK counterpart for three months on a development project. In the meantime, I loaded my suitcase with clothes that are “village-friendly”. No more jeans and tops. My office is at ten minutes walking distance, an abandoned room with a tinned roof, broken windows, and doors with completely nothing in it, not even a chair and a table. The only market in the village only becomes alive in the evening for couple of hours where only men come and socialize. Mode of transportation would be 3 wheeler rickshaw van and only needed if I need to get out of the village for some reason. Traffic? Well, the van driver has to slow down or brake if only there’s a queue of ducks crossing the road or a livestock relaxing on it like he owns it. I and my counterpart chaired a meeting with the people we will be working with in the village. Here, we, especially my UK counterpart were alien too. We were asked questions that are similar to the questions asked in the ministry. This time, it was easier to answer because the answer involved them, their well being. We were there to work with the youth of the village, mobilize them, make them aware and vocal about their rights, and train them for life skills, skills that would earn them livelihood. At the same time, we will be involving the local government and make them more responsive towards the community. They accepted us at once, without any further question or doubt. They said they’ll be waiting for the time when we finally shift there and get started with the project work. We came back with hearts full of hope. We met our volunteers, shared all the information received during the field visit. Together we travelled for 14 hours to get to the community, dealing with all kind of hardship together, starting from flat tire to slow service of lunch at a highway restaurant. We got welcomed at our village by heavy rain almost at the middle of the night, yet all of us found our way to different host homes. “Tomorrow is a new day,” said my counterpart. It had been just 2 weeks I know him. He is not a person to be judged at first sight. The only thought that crossed my mind when I first saw him is, “Whoa! That’s a tall one!” Within two weeks I realized I wouldn’t have gotten a better counterpart. He’s the kind of person who would have a definite direction and purpose before setting out for somewhere. He’s one of the few gentle men I have met in my life with all the British-like manners poured in. You know, adding sorry, thank you, please at the end of each sentence, holding up doors, always let the ladies go first and so on. He’s very focused and passionate about the project (so am I!). He’s a good listener which is much needed for making the leadership role more balanced. Most importantly, he has his share of humor when it’s needed, which is a big relief for me. Altogether, we have built a strong working relationship. We did a great job in terms of team building. Everyone seemed super excited to know their roommates and counterparts. We were so excited to get started with the project. Team Northwest was on! On the night of our very first day in the community we got to know that my counterpart has to leave for the UK to resolve a menial visa issue, immediately. After a long day of orientation, me and my counterpart sat together to reflect back to what we did for the day and what needs to be done. That’s when I got a call from the Project Manager and was conveyed this news. He said not to be frustrated, but I know how hard it is to have a straight face. I am not fancied by the line “The show must go on”. I and my counterpart realized we have no control over this issue. So we decided to do what’s best for the project: I stick to the planned activities while my counterpart flies back to the UK to resolve his visa issue and help with the project work as much as possible from long distance. 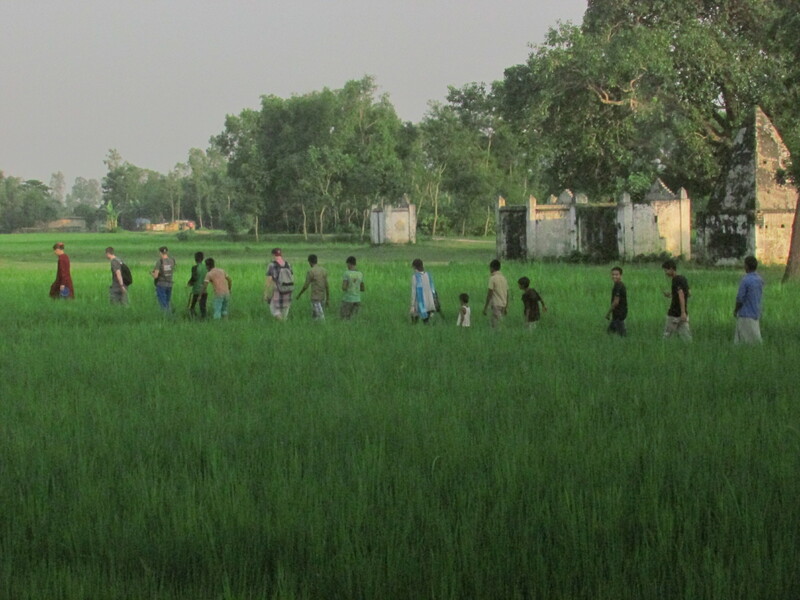 So here I am, in a remote village of Northwest Bangladesh, with 18 people of around my age from two different parts of the world, standing in one leg like a flamingo, eager to put the first step towards the project, eagerly waiting for the return of the other Team Leader with fingers crossed. I and my team ARE a little frustrated, but we are not hopeless. We are still working together on building the pillars of the project. It’s a full moon tonight. All my team members came together to embrace the moonlight and suddenly I feel so lucky to have such a wonderful team! All these changes took place within four weeks, just four weeks. I love my life!